Tämä jahti on erittäin tilava ja valoisa, ja sen ympäröivät ikkunat tekevät näkymät merelle uskomattomiksi. Venesatama ja sen tontit ovat tarkkoja ja sijaitsevat keskellä turkoosi paratiisia, jossa on hämmästyttävä veden selkeys. Oleskelusi sisältää ilmaisen pääsyn sataman yksityiseen uima-altaaseen, ravintolaan, yksityiseen uimarannalle ja tiki-baareihin. Venesatama sijaitsee lähellä keskustaa ja monia vähittäiskaupan, ravintoloita ja nähtävyyksiä, joissa on 24 tunnin vartiointi. Tarjoamme myös auringonlaskun purjehduksia, täyden ja puolen päivän retkiä sekä yöpymisiä ja laajennettuja peruskirjoja, jotka viettävät yösi ankkuroituna yksityisten, suojattujen saarten vieressä lisämaksusta. Suosittelemme purjehtimaan kauniisiin Dry Tortugasiin lisämaksusta vähintään kolmen yön matkalle ja viisi yötä edestakaiselle matkalle, mikä tekee tästä jahdista ikuisen muistin. Veneeseen ei ole liikettä, kun se on satamassa, joka on sidottu telakkaan. Voit nukkua hyvin tähän veneeseen, jossa on tilava salonki, ohjaamo ja makuuhuone. Tarjoamme myös kahden hengen tandem-kajakkia käyttöösi venesatamassa ja sen läheisyydessä sekä ottamaan mangrove-takaisin vedet. Voit myös ottaa kajakin ulkouima-altaaseen, joka on vain kolmen veneen pituuden päässä siitä, mistä tämä vene pidetään. Ota yhteyttä meihin tämän ilmoituksen kautta, jos tämä huvila ei täytä vaatimuksiasi, koska meillä on muita veneitä. Listalleottohinta koskee vain yöpymistä satamassa. This was a wonderful vacation. Nancy, Zack and Ben were awesome. Nancy was always just a text away for all our needs. The boat was in excellent condition. They had everything we needed on the boat(linens, toiletries, a small kitchen with most things you will need etc) the marina had a very clean toilet/bath too. We sail for 4hrs one day and Zack and Ben were great. They took us around and explained all the things we saw. Over all it was a excellent trip. The boat was wonderful. we thoroughly enjoyed our coffee on the deck and grilling at the Tiki Hut. We would recommend the Lions Paw to anyone looking for a different stay experience . Our sail with Capt Janet and Capt Nancy was excellent and the snorkeling was wonderful. Absolutely beyond expectations. We love to have new and unique stays and this was a great one. Communications from the start of booking to the greet session expertly handled. Information ,print outs were all effortless for our convenience. The sail boat beautiful, immaculate and located conveniently to the tiki hut for easy access for showers and bathrooms. The owner was congenial and a pleasure to talk to as was the other individuals who captained the boat on our day that we sailed. Captain Pam and a team member i believe Steve? The half day sail was a new experience and with forethought of prescription scopolamine patch absolutely no issues with sailing although in past i could get seasick looking at a docked vessel. 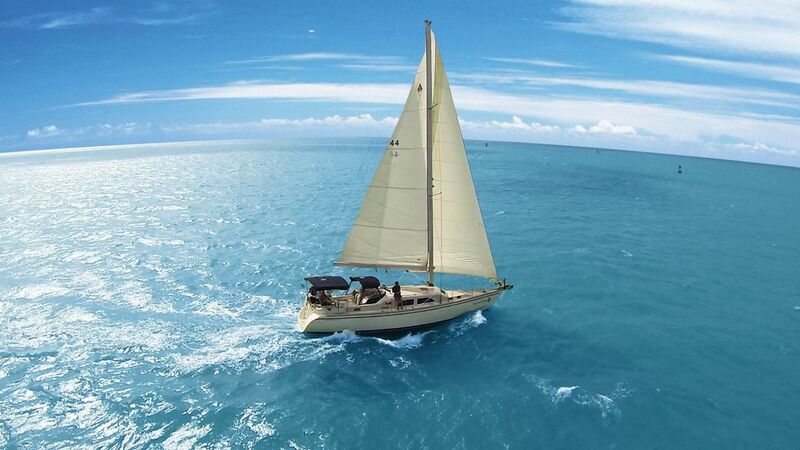 Great location for a easy drive to Key West for a day at town and other key locations. We ate at the Hogfish Grill restaurant located literally a few minutes from the marina. It was an island favorite from the crowds and food very good for the area. We experienced a day with AWS fishing charters from Key west for Flat fishing . It was a pleasure to do and great day of barracuda fishing.! Relatives meet us and stayed a few days with us and they also enjoyed the boat experience. The website is great for pictures of both rooms and facilities. It was surprisingly very comfortable . Plenty of amenities and we used the kitchen for a simple pasta dinners and simple breakfasts. The boat had plenty of extra everything from aspirin, lotions, soaps towels condiments etc everything you would need or forgot. We did stop to purchase keurig coffee to be sure we had a morning brew. The marina is very nice and getting into marina after first greet session was fine. Nancy met us at night time, which was appreciated due to darkness to navigate us to parking after that a breeze. The water crystal blue and so pleasant to watch birds, other water crafts etc. Please try this experience, take advise from one that had a little trepidation to know you would love the experience immensely. It exceeded our expectations and we don't have any recommendations for any improvement. It is obvious that their concern for their renters- clients is a priority. The weather was great except for one day which we used to stay on the boat and reconnected with family .It was perfect. The day we left was 92* and returned to 15 degree weather and an ice storm. What a great respite from the northern winter, Thank you sincerely very much. .Memories will literally warm us. Five of us stayed on the yacht for 5 days and 4 nights. The dock location was perfect. We were close to restrooms/showers and the tiki hut. Our last full day we went out to sea with Captain Janet and Nancy. If you want a totally different VRBO experience, then this is the way to go. Great stay on a great boat! We loved boat living in the Harbour! The boat was clean and spacious but it had a gas/diesel smell.My experience was not as expected from the time we got to the boat we were told someone was going to show us where and how everything worked well all we got was a phone call trying to instruct us . The really bad thing was that they falsely advertise they have TV service when in fact they have 3 TV ‘s that don’t work. When I questioned the man about it he referred me to captain Janet .she was not very accommodating and more or lass said just deal with it. I would not recommend staying on this boat. I regret we did not meet your expectations. My representative waited two hours for you to arrive after you agreed to meet him at a set time. He was in contact with you the entire time and you missed at least two ETA’s. You ran late. We understand that happens but please don’t blame us for your tardiness. Two hours is a very long time to wait and he had other guests to greet that evening. The issue with the television has been addressed. I communicated with you several times and did my best to accommodate your need for TV but was not able to identify the problem during your two day stay. We take a lot of pride in our boat and always aim to give our customers a great experience. Most of the time we exceed their expectations. A reservation request may be required to take in a half day, full day, or 24 hr island adventure in addition to their nightly stay based on the time of year and the demand.